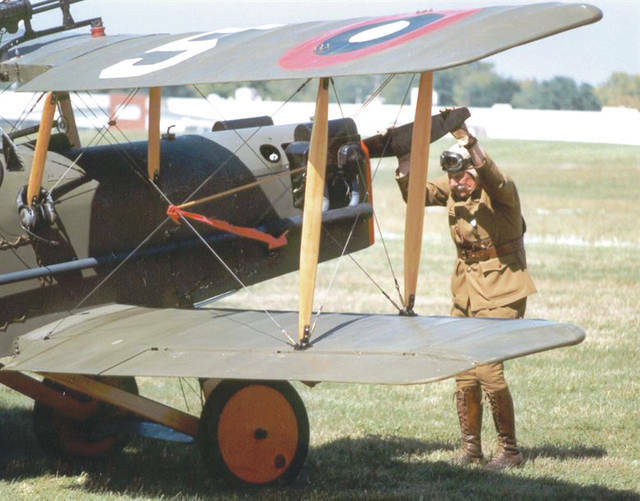 Submitted photo Commemorate the 100th anniversary of the end of World War I as one of the nation’s premier historical aviation events brings the excitement and adrenaline of early air power to Ohio, Sept. 22-23 at the National Museum of the U.S. Air Force. WRIGHT-PATTERSON AIR FORCE BASE — Commemorate the 100th anniversary of the end of World War I as one of the nation’s premier historical aviation events brings the excitement and adrenaline of early air power to Ohio, Sept. 22-23 at the National Museum of the US Air Force. The World War I Dawn Patrol Rendezvous will feature vintage reproduction full-scale and 7/8-scale aircraft, such as the Nieuport, SE-5 and Fokker Drive I triplane. Pilots will perform precision flying in the skies above the museum and participate in a mock shoot down of an enemy aircraft, with aircraft launching from and landing on the field behind the museum. According to WWI Dawn Patrol Rendezvous public address announcer and the author of “THE STAND: The Final Flight of Lt. Frank Luke, Jr.,” Stephen Skinner, the event will provide the best chance in a lifetime to experience the sights, sounds and smells of WWI aviation. https://www.fairborndailyherald.com/wp-content/uploads/sites/50/2018/08/web1_070306-F-1234S-029-1.jpgSubmitted photo Commemorate the 100th anniversary of the end of World War I as one of the nation’s premier historical aviation events brings the excitement and adrenaline of early air power to Ohio, Sept. 22-23 at the National Museum of the U.S. Air Force.